The Crawford Fund’s public awareness campaign supports Australian working journalists to visit agricultural research for development projects in developing countries. In 2013, we awarded the inaugural Crawford Fund Food Security Journalism Award, with the prize being a ‘seeing is believing’ visit. Over the years, destinations for journalists have included East Timor, Laos, Taiwan, Cambodia, Indonesia, Syria, Tajikistan, Kenya, Solomon Islands, Vietnam, Thailand, Peru, Mexico, Tanzania, Burundi and the Philippines. The ‘seeing is believing’ reports resulting from the visits provide first-hand accounts exemplifying approaches to the betterment of agriculture, fisheries and forestry in developing countries through agricultural research, development and training. Two former Journalism Awardees (pictured right) undertook their ‘seeing is believing’ tour in 2016. 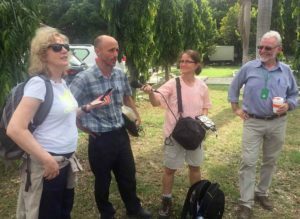 Elizabeth Finkel, editor of Cosmos Science Magazine, and Sarina Locke, national reporter for ABC Rural, completed a 10-day visit to Timor-Leste—the aim of which was to see agriculture for development projects in the field and attend Timor Leste’s food security conference. You can view their reports here.